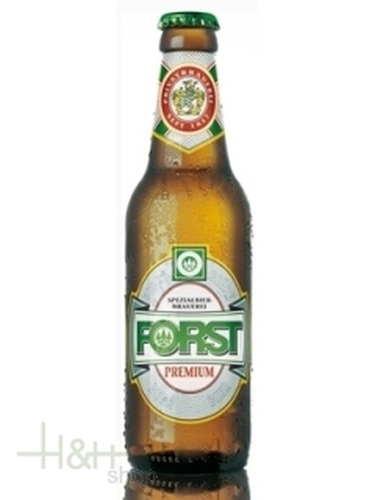 Forst Premium A beer with tradition! Forst Premium is a beer with fruit aftertaste, very refreshing. Delicatamente Lightly bitter, with delicate perlage and thick froth, it is fit for every occasion. Tasting it, let yourself involve in a sensation of freshness that will give you a new dynamism. This beer is the result of wise mixture of the best malts, not too light, an ideal beer for a drink between meals, but also for a quick and not binding breakfast; it transmits freshness and joy of life. Born an exclusive recipe of the Forst Brewers, like every kind of Forst Beer, this one has an old tradition. Beer Forst 1857 330 ml. 1,90 EUR / 5,76 €/lt.